When we think of the railroad which ran through our town, we often think of the school children that rode the train to Berlin from Stephentown and Petersburgh (as seen above). You may also know that there was a milk train, a mail train, and a freight train. 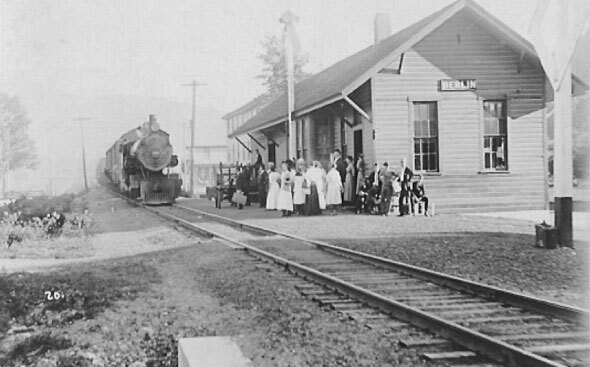 Many do not realize that the train also took our Berlin baseball team to the towns of our rivals, and a crowd would greet the returning team, or that one could go to New York City (as A. C. Niles did to stock his general store on Main Street), or points north as far as Rutland, Vermont. By changing trains in North Petersburgh, one could go to Troy or other places. The Berlin station was “the most important and profitable station between Chatham and Bennington” according to a Rutland Railroad historian. By 1900, the Rutland Railroad was leasing The Chatham and Lebanon Valley Railroad. A pamphlet of that year has a list of hotels, farmhouses and cottages and villas taking summer boarders. Many folks came to Berlin on vacation during the summer to breathe the fresh, clean air, behold the beautiful scenery, see the gladiola fields, fish, visit friends, or just relax. No fewer than 41 listings for boarders are under South Berlin (now Cherry Plain), Center Berlin, and Berlin! Among those who took summer boarders from Cherry Plain were three Mattison families and Mrs. Elmer Burdick; from Center Berlin, Mrs. H. D. Tanner; and from Berlin, H. F. Brown (Jane Fitzgerald’s home), J. Dennison, The Berlin Hotel, W. H. Lewis, Mrs. A. E. Sands, Mrs. J. A. Rasico, Mrs. J. W. Stillman, C. E. Jones, Adnah Jones, and A. C. Niles. The price of a room varied between $4 and $10 a week while the Berlin Hotel charged between $1 and $2 a day and had accommodations for 40. Most private homes could accommodate between 2 and 6 boarders. Most of the places taking summer boarders were listed as less than a quarter mile from the station. In 1901 the Rutland Railroad purchased the Chatham and Lebanon Valley Railroad, which it had been renting, and continued to run trains through Berlin until 1953. Did you go on the last excursion to Rutland that year? It was sad to see the railroad go for it had certainly contributed to Berlin being the most progressive community in the valley. It was with the help of the railroad that Berlin came into its own at the turn of the last century. W. J. Cowee, Inc., was in its infancy; Arthur Cowee was growing and popularizing the gladiola. Talk was underway to start a fire company, which became a reality in 1904. The Frary Spool Company, Satterlee’s Cheese Factory, the Taconic Valley Bank, the Old Fellows Lodge, the Berlin Electric, Light, Heat and Power Company, and the Water Company, as well as an accredited high school would all be in place during the first decade of the last century. The railroad provided businesses with an inexpensive way to ship their products helping their businesses grow, and many individuals were employed. Arthur Cowee built his bulb house across from the station for easy access to shipping his bulbs around the world. (That building later became the Community Hall and eventually the Fire Hall. Cottage industries also sprang up and many benefited from being able to rent rooms to summer boarders making Berlin a prosperous community. Later, Ted and Tommie Cowee donated the building to be used by the Boy Scouts and Camp Fire Girls to have a meeting place. The building then became known as the Watipi building. (The name was chosen because it is an Indian word meaning “Meeting place”.) The ideals of those organizations certainly had an influence on the youth of our community that led to volunteerism and many other attributes we look for in the members of our community. Note: To learn more about it, read Memories of Berlin by Katherine Wells.